But her mother's shouting fell on deaf ears. From a young age, Thandeka had grudgingly listened countless times as her mother went on about how amazing it would be if Thandeka could marry into the royal family, about how her mother would be the envy of Moeng village to have a daughter married to a prince. BUT THANDEKA had different views about what her future held. She didn’t want to be like all the other women in the village: a mousy, uneducated, obedient wife whose job was to reproduce, cook and clean for an ungrateful, cheating husband who spent all his time in beer halls, dabbling in the game of debauchery. Thandeka had different plans. She'd been waiting for the right moment to tell her mother the wonderful news: three days before, a letter had come, like a miracle, telling her that her dream university in the city had finally accepted her and offered her a full scholarship. She was going to study medicine and go on to specialise as an oncologist. But she had yet to tell her mother, for she knew that there was nothing the old woman could say to change her mind. Her humble father had always told her that education must always come before everything else – even marriage. Ma Maria was in full flood. Thandeka could not believe her ears. Her own mother was telling her to go and prostitute herself to the prince, just to elevate her social standing in this tiny village. She took a deep breath and said: “Mama, please calm down! Firstly, I will not sell myself to the highest bidder. What you're asking of me is unethical and disgusting! I don't know what misguided, crazy ambition you had of me becoming a royal wife, but let me stop you right there. Thandeka was in tears as Ma Maria interrupted, unmoved by her daughter’s raw emotion. She shouted back: “Again with that rubbish of university! Your job as a woman is not to be educated and work in an office, it’s to have children and cook, a woman’s place is in the kitchen and if you do not want that for yourself, then you truly are a disgrace!" And Ma Maria stormed out of Thandeka’s room and into her own. The sound of her door hitting the metal frame rang through the household. 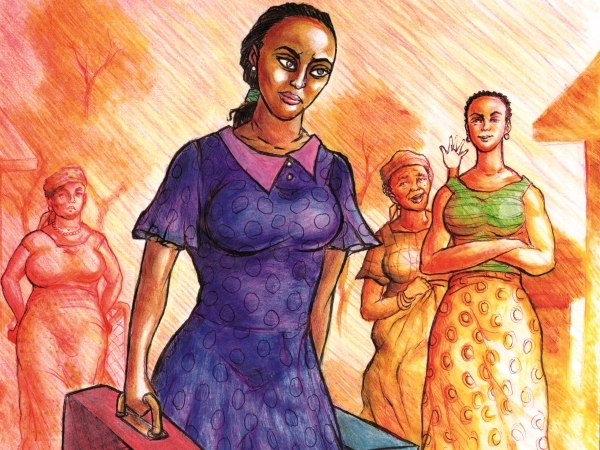 Later on that day, as Ma Maria banged her pots and utensils in the kitchen, preparing the evening meal, Thandeka walked in, dragging the two suitcases her father Josias had brought back after all those years in the city. THANDEKA left her home and all that she knew. She lifted the rusted steel gate and walked through it. She waved goodbye to Busisiwe who was in the yard with a smiling Nkhono Sali. With a suitcase in each hand she started walking down the dusty gravel road towards the taxi rank. “You must come for Busi's wedding next month my dear!” Nkhono Sali called. “Yes, Nkhono, I’ll try to make it,” Thandeka replied. Ma Maria watched as her daughter disappeared down the road, trying to understand how Thandeka’s words would change her life. Then suddenly and unexpectedly, a great peace came over her, as she smiled and waved at Nkhono Sali. Then she started running after her daughter to give her a proper goodbye.